The Presidential Inn & Suites is your gateway to Chicago! The hotel is centrally located 27 miles from Chicago, 19 miles from Joliet and 27 miles from Oak Park. It is situated 21 miles from the nearest airport, Midway International Airport and nearby many landmarks such as the Chicago Speedway, the Museum of Science and Industry - Chicago, Adler Planetarium & Astronomy Museum, Grant Park, Bank of America Theatre and shops at Northbridge. Eat, Shop, Work, and Play – It’s all here at the area’s best value hotel – the Presidential Inn & Suites, Matteson, IL! If you have children, be sure to visit Odyssey Fun World during your stay in Matteson, IL. Odyssey Fun World is your one stop shop for fun and excitement for kids of all ages! It is inexpensive to visit and offers the perfect opportunity to wind down and have some fun. 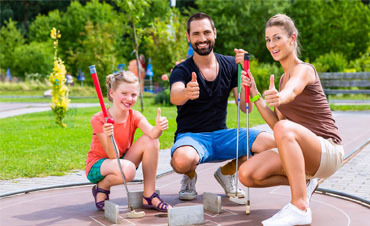 They offer miniature golf, zip-lining, arcade games, boat rides, laser tag, bumper cars and so much more! Children will enjoy collecting tickets and redeeming them at the redemption center. 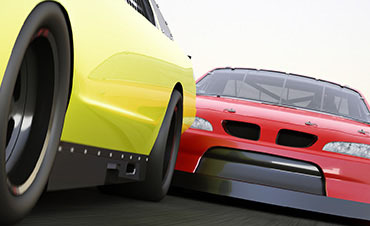 During your visit to Matteson, IL be sure to take in a NASCAR Race at the Chicagoland Speedway. Whether you are new to the sport or just new to the track, Chicagoland Speedway has all the information you need to make your NASCAR weekend a success! Conveniently located 30 miles from the Presidential Inn & Suites, be sure to take a tour of Chicago in a trolley or a double decker bus. What better way to explore downtown with great views? 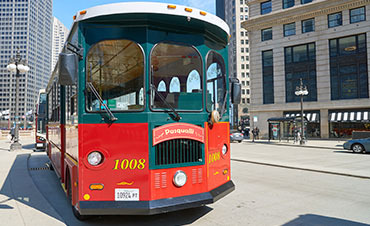 The Chicago Trolley & Double Decker Co. has been operating in Chicago for 22 years and their drivers and tour guides are professional, natural performers that are well trained. They have one thing in common: a passion for all things Chicago!